Share Your Funny #babytroublemaker Stories and Win Big with MAM! You are here: Home / Giveaways / Share Your Funny #babytroublemaker Stories and Win Big with MAM! Have you ever caught your baby doing something he or she knows they shouldn’t be doing, like scribbling a ‘masterpiece’ on your walls or throwing food ALL over the floor? 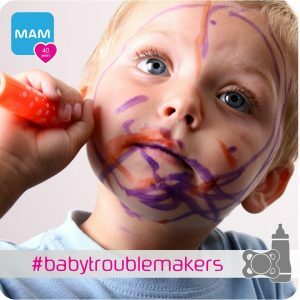 Share your story with #babytroublemakers and #contest on the MAM Facebook page https://www.facebook.com/MAMbabyUSA/ and they will select three lucky winners to win one of three $100 prepaid cards! And remember: as trying as these moments are now, they’re what we’ll look back at and laugh at together when they’re all grown up! We have also teamed up for a Giveaway! One winner will win a $30 package of MAM products! To enter, leave a comment below telling us why you love MAM products! Deadline to enter is January 20th, 2019 at noon PST. U.S. Residents only. Self Disclosure: No compensation was received to post. The giveaway prize package will be sent to the winner. SoCal City Kids will randomly select the winner for the giveaway prize package ($30 MAM products package.) Other credit: MAM. I love the design of MAM Pacifiers! My baby enjoys their teethers a lot. My son’s favorite bottles are MAMs! I also love them since they’re the easiest bottles to clean. My grandchild could use more Mam products. So far we have only tried the bottle. Would be interested in trying more products. My kids enjoy their bottles! My baby enjoys the Mam pacifier quite a lot. They’re great!